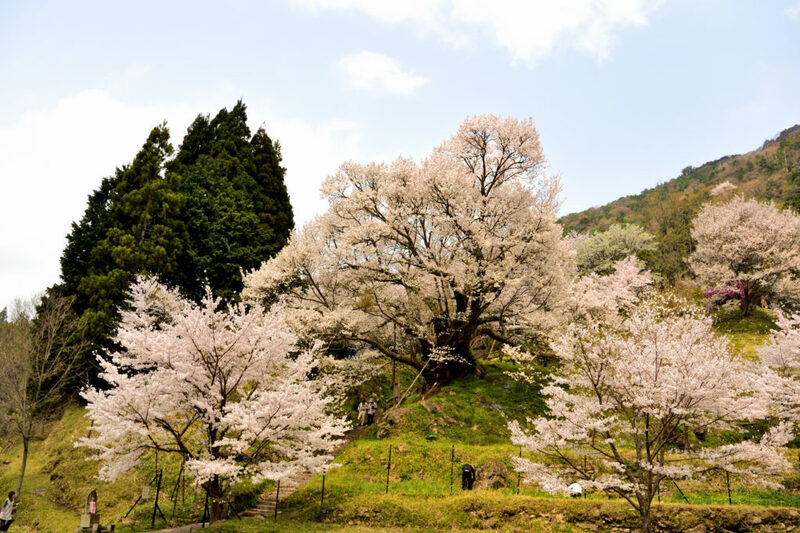 Located in Uda-city, in the eastern part of Nara Prefecture, Butsuryu-ji Temple has a huge tree called the "1000-year cherry tree," and as the name suggests, it is nearly a thousand years old. Butsuryu-ji Temple is is an old temple that is said to have been founded in 850 by Konei, the disciple of Kobo Daishi (Kukai). When you arrive at Shiryu-ji Temple (Buryu-ji Temple), you will be greeted by a tasteful scene. “A thousand years cherry tree” is about 8m around the root and about 16m high, and it has a majestic appearance. At 2 meters from the rootstock, branches divided into 11 branches grow in all directions and bloom flowers. I survived the nature of the deep mountains, put on the cherry blossoms that still overflowed even after 900 years, and am impressed by the divine appearance that healed people. A lot of tree flowers are blooming in the garden of Ono-ji, and magnolia, yamabuki, and red maple sprouts have colored the ground to wait for the recovery of cherry blossoms. There is another cherry blossom that I want to see near the thousand-year cherry blossoms. It is a single cherry blossom that blooms in the rice fields of the Morokino village. As the population ages, only four households live in the village. It will be in full bloom in the middle and late April, but its tree shape is beautiful, and reflecting it in the paddy field attracts visitors. The type of cherry blossoms is a species called “Akaba-usuzumi-zakura”, which is about 70 years old. In full bloom season, many people visit along narrow narrow roads to see cherry blossoms in the paddy field. Villagers say that is a small festival. 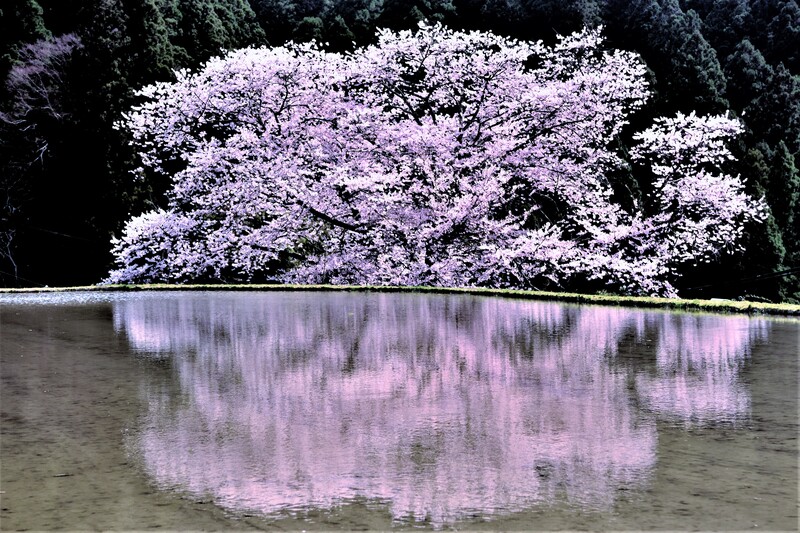 The cherry blossoms on the water surface change color over time, and when the wind blows, they change their expression. “Matabei cherry blossoms”, weeping cherry blossoms of Ono-ji, “A thousand years cherry tree” in Butsuryuji temple, and cherry blossoms of Morokino. People have always been close to the history of cherry blossoms. Each cherry tree receives the thought of many people who cross over a long time, and heal the heart of the person by putting on a beautiful flower that tells the spring. The story of the cherry blossoms of Uda. There was such a beautiful movie scene that I could not imagine it being a reality.